The 2014 lacrosse season kicks off this weekend with the Adrenaline Challenge. Sandstorm at the Empire Polo Grounds in Indio and the Air Station Shootout at the Great Park in Irvine quickly follow and then we are into the high school season. With all the momentum carrying over from 2013, 2014 should be even better. Here are my 10 fearless predictions (plus one no-cost bonus prediction) for things that are sure to happen in 2014. I like to warm up with a few easy ones. The mother of Boston University-bound senior Hayden Ruiz does it all for Santa Margarita Catholic High School. She takes the pictures, coordinates the alumni games, organizes the banquets, picks up the pieces, etc, etc, etc. Whatever she does, the end result is first class! She is the heart and soul of Santa Margarita lacrosse, and our four years there would not have been the same without her (ok Rudy, you too!). Ms. Kingsley and her bags of candy are a fixture at the JSerra’s scorer’s tables. Never one to participate in trickery or tom foolery, she is always willing to share with the opposing team. Never had the pleasure of scoring a game with Tricia? Put it in on your bucket list but do it soon; her son Mitch is off to Hofstra University in the fall to play some D1 ball. Beckman High School returns a talented group from last year’s 14-5 team. While other programs struggle to find coaches, the Patriots have put together an impressive staff led by new head coach Brendan Finnerty and former Capistrano Valley High School head coach Joel Schmitt-Kallas. The Patriots will improve upon last season’s performance and make it to the quarterfinals at least. The talented Santa Margarita middie missed all of last season with a torn ACL. Cook, who is ultra quick, can cut on a dime, and rip it with either hand, will be back to full strength this season. Look for him to be one of the top uncommitted seniors in the County. St. Margaret’s Episcopal School, JSerra Catholic High School, Foothill High School, Corona del Mar High School, and San Clemente High School will compete for the final four spots in the playoffs. Only the Tritons did not get that far in 2013. I expect the Tritons to make it this year. The tougher question is: who will they displace? The Denver University Pioneers defeat the Notre Dame Fighting Irish 8-7 in a five overtime instant classic in front of a standing room only crowd at Orange Coast College. Ryan Mix (Corona del Mar High School) scores 7 goals for the Irish. Scott McGowan (St. Margaret’s Episcopal School) converts 7 of his 20 groundballs into assists on Eric Adamson (Foothill High School) goals. With no end of the game in sight, Coach Tierney and Coach Corrigan will call recruits Nate Marano (Foothill) and Hugh Crance (CdM) out of the stands to settle the game in a braveheart. Marano scores easily when Crance has to leave for football practice. The weather, location, and pool of lacrosse fans make Orange County a natural for the MCLA nationals. The MCLA can expect great fan support, and local players will get a chance to see first hand that they can stay close to home and play some quality college lacrosse. Be there and let the MCLA know that the OC and not Green Acres, oops I mean Greenville, is the place to be. 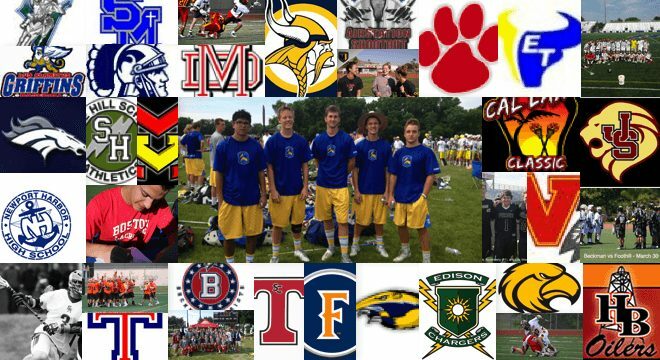 Santa Margarita and Tesoro are the Hatfields and the McCoys of high school lacrosse. The two teams have played four times since 2011. All but one game has been decided by one goal. Santa Margarita has won all four on the field but last year’s epic comeback was overturned by the CIF due to an administrative error on Santa Margarita’s part. Adding to the tension is the fact that the Titans are led by El Toro High School alum Adam Miner and the Eagles are now lead by El Toro alum Adam Guy. This year’s rematch will determine who is that greatest lacrosse coach in history named Adam that graduated from El Toro High School. My heart may be leading my head but I think Adam will be the Guy. A handful of players will awe coaches and fans with the jaw dropping offensive skills they developed playing box lacrosse this fall. Most everyone who did not play box lacrosse this fall will get the hint. Box lacrosse will be the next big thing, and field fall ball will become close to extinct. We have been neglecting the girls’ game for too long and it is about time to start giving the girls the attention they deserve.